F. De la Presa, 'La joven pintura mexicana', La Prensa, Lima, April 20, 1961 (illustrated). 'Surrealismo: con Varo de lo inesperado en el mundo', Novedades, Magazine, Mexico City, August 9, 1964 (illustrated). Exhibition catalogue, La obra de Remedios Varo, Museo Nacional de Arte Moderno, Palacio de Bellas Artes, Mexico City, 1964, cat. 133 (illustrated). R. Caillois, 'Inventario de un mundo' in Remedios Varo, Era, Mexico City, 1966, no. 47 (illustrated in color). B. Arredondo Muñozledo, Historia Universal Contemporánea, Porrúa, Mexico City, 1972, p. 52 (illustrated in color). G. Orenstein, 'Art History and the Case for Women of Surrealism', The Journal of General Education, Pennsylvania State University Press, Philadelphia, Spring 1975. E. Jaguer, Remedios Varo, Filipacchi/Era, Paris and Mexico, 1980, p. 16-17 (illustrated). J. Kaplan, 'Remedios Varo: Voyages and Visions', Women's Art Journal, Knoxville, Fall 1980 (illustrated). A. Dallal, 'El universo sensible de Remedios Varo', El Sol de México, Mexico City, October 12, 1983. B. Taracena, 'Espacio y tiempo', Tiempo, Mexico City, September 19, 1983 (illustrated). E. Lauter, Women as Mythmakers. Poetry and Visual Art by Twentieth-Century Women, Indiana University Press, Bloomington, 1984, p. 88 and 92. L. Ávila, 'Remedios Varo, la clarividencia alquímica', Uno Más Uno, Sábado, Mexico City, April 14, 1984. W. Chadwick, Women Artists and the Surrealist Movement, London, Thames & Hudson, 1985, p. 212 (illustrated) and p. 218. L. Andrade, 'Remedios y la alquimia', México en el Arte, Fall 1986. P. Boves de Harcourt, 'El panteísmo onírico de Remedios Varos', Karma, Mexico City, March 1987 (illustrated in color). J. Kaplan, 'Remedios Varo. An Art Essay', Feminist Studies, College Park, Maryland, Spring 1987 (illustrated). J. Kaplan, Unexpected Journeys: The Art and Life of Remedios Varo, Abbeville Press, New York, 1988, pp. 168-169 (illustrated in color) and on cover (illustrated in color). J. Kaplan, Viajes inesperados. El arte y la vida de Remedios Varo, Fundación Banco Exterior, Madrid, 1988 (illustrated on cover). Exhibition catalogue, F. Martín, 'A una artista desconocida', in Remedios Varo Madrid, 1988, pp. 26 and 28. P. Engel, 'The Traveller, the Surrealist Whose Works are Seldom Seen', Connoisseur Magazine, New York, February 1988 (illustrated in color). J. Malpartida, 'Remedios Varo', Galería de Iberoamérica, Madrid, November 1988. B. Morton, 'Unexpected Journeys. The Art and Life of Remedios Varo', The Times, Higher Education Supplement, London, October 28, 1988. E. Jaguer et al., Art Vivant no. 32, Tokyo, 1989 (illustrated). A. Consalvo, 'Remedios Varo. De las palabras y lo visual', Plasticiudad, Artes de Monterrey, Monterrey, March 9, 1989. 'El exilio español', Omnia, Universidad Nacional Autónoma de México, Mexico City, December 1989 (illustrated). S. Espinosa de los Monteros, 'Remedios Varo', Arte en Colombia, Bogotá, May 1989 (illustrated). L. Andrade, Remedios Varo y la alguimia, Universidad Iberoamericana, Mexico City, 1990, pp. 18, 56 and 78. G. Orenstein, The Reflowering of the Goddess, Pergamon Press, Elmsford, New York, 1990, p. 37. B. Varo, Remedios Varo: en el centro del microcosmos, Fondo de Cultura Económica, Madrid, 1990, p. 135 (illustrated). E. Guigon, 'Imágenes y textos en la obra de Remedios Varo', in Remedios Varo. Arte y Literatura, Teruel, Spain, 1991, p. 19. Ciencia, June 1991 (illustrated in color on cover). L. Franco, Las III Jornadas sobre surrealismo bajo signos del exilio, El Heraldo de Aragón, Zaragoza, Spain, October 1991. L. Andrade, 'México, viajes en los confines del sueño', El Día, El Gallo Ilustrado, Mexico City, November 22, 1992 (illustrated on cover). B. Morris, 'El surrealismo extragaláctico de la pintora Remedios Varo', Turia, Teruel, Spain, October 1992. A. Ramírez Barreto, 'Dinámica imposible', La Nave de los Locos, Morelia, Michoacán, May 1992 (illustrated). L. Andrade, Remedios Varo metamorfosis, CONACULTA, Mexico City, 1996 (illustrated in color). R. Ovalle and W. Gruen, eds. et al., Remedios Varo, Catalogue Raisonné, third edition, Ediciones Era, Mexico City, 2002, p. 229 (ilustrated in color) and p. 353. Lima, Peru, Instituto de Arte Contemporáneo de Lima, Pintura Mexicana Contemporánea, April 1961. Mexico City, Museo Nacional de Arte Moderno, Palacio de Bellas Artes, La obra de Remedios Varo, August 1964. Mexico City, Museo Nacional de Arte Moderno, Remedios Varo 1913/1963, August 1983. Madrid, Fundación Banco Exterior, Remedios Varo, November 1988. Monterrey, Museo de Monterrey, Remedios Varo, February 1989. The universal appeal in Remedios Varo's work lies in its ability to make the viewer 'recognize' the emotional content in her images despite that s/he may never have seen them before but that s/he has imagined or sensed intuitively. The internal world of Remedios Varo is fraught with conflict over separation, which in her particular symbolism of locomotion, means moving, changing, leaving, and breaking away. Somehow, as Varo developed as a person, some uneasiness over what aloneness meant frightened her and this fear remained with her. This preoccupation appears repeatedly in her work, whether in poetic images such a Mímesis, 1960, in which the personage sits in a chair and her ambivalence over rising and leaving is conveyed by her separation anxiety. Thus, she gradually transforms into an object from which she does not wish to separate, in this case, the chair in which she is sitting. Or in Ruptura, 1955, an immediate, more powerful image, the personage is finally able to break away--leaving for good. When Remedios Varo (1908-1963) created Exploración de las fuentes del río Orinoco, 1949, she had not been to the Orinoco in ten years. Yet her need to understand her conflict over separation was symbolically portrayed in a visit she made to her Mother, 'the source' of her separation anxiety and whom she had not seen in at least ten years since leaving Spain. The decision to make the trip had been carefully made; her Mother had come to America with her son Rodrigo, Remedios' brother who had been employed as chief of Epidemiology at the Ministry of Public Health in Maracay, and it seemed like a good opportunity. Shortly before, Benjamin Perét had returned to France and Remedios had a new lover, Jean Nicolle with whom she traveled. As well, meeting her Mother in Venezuela seemed more appealing than returning to Spain, where Franco was still in power. After her arrival in Mexico from France in 1941, following a grueling experience in Europe during World War II, which she painfully portrayed in the painting La Faim, (Hunger), a work she left behind with André Breton, Varo readily adapted to life in Mexico. She was tired of the constant moving often associated with ambivalent, if not paralyzing situations, from her simple need to break away from home and come into her own as a person, where her conflict began, to confronting the disasters of the Spanish Civil War first, and later those of World War II. Varo had suffered hunger in more ways than one, but in Mexico, unexpectedly, she found herself at home, even after arriving with the belief that some day she would return to live in Europe. In a drawing by Leonora Carrington done on January 8, 1944, Carrington portrays herself, her soon-to-be husband, Chiki Weisz, Varo, and her then husband Benjamin Péret, sitting in an amphibian boat, rowing back to Europe and bringing with them their animals--her dog Pickwick, and Remedios' cat, Piloncillo and parrot Don Mascarino. The fact was that Varo did not like traveling, which she associated with anxiety. Instead--she preferred walking--if she could, wherever she wanted to go, which ultimately limited her life but simultaneously gave her a sense of security. When she finally decided to return to Spain, via Paris, she realized that once one is out of the nest, it is best to stay away. From the Hotel L'Aiglon, on 232 Blvd. Raspail, she summed up the experience in a postcard: "I am vaguely afraid, everything is so different! One should not see again nor the persons nor the things that one had idealized after too many years." Salomon Grimberg, Dallas, Texas, September 2007. 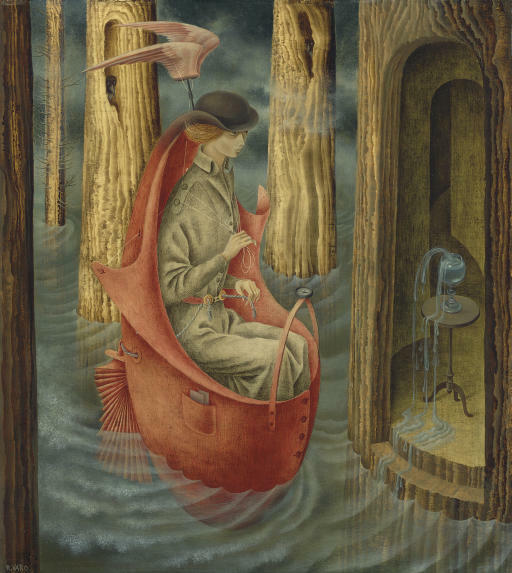 The Spanish artist Remedios Varo was forever embarking on journeys. Sometimes they were journeys of escape: from her restrictive Catholic childhood, from war-torn Europe, from confining relationships. Sometimes they were journeys of discovery: of the surrealists in Paris, the country of Mexico, her inner terrains. Her paintings reflect a life spent in physical and psychic transit and often feature women, with determined expressions, exploring the boundaries of known and imagined worlds. Delicately and meticulously painted, Varo's works have a haunting quality. Full of mystery, wonder and a subtle humor, they are also infused with a sense of melancholy--that of a stranger living in a strange land. Varo arrived in Mexico with her companion, the French surrealist poet Benjamin Péret, at the end of 1941. Lázaro Cárdenas, Mexico's President at the time had an extraordinarily generous policy towards war refugees and because of this Mexico City in particular saw the growth of a lively community of foreign intelligentsia. Although many of these individuals thought of Mexico as a temporary asylum, many also stayed in the country permanently such as Varo and her close friend, the British painter Leonora Carrington. A tremendous cultural cross-fertilization occurred that profoundly influenced artists, writers, and individuals of all creative persuasions and which only recently has been explored by historians and scholars. Varo and Péret became integral members of a vibrant émigré community that included such notable persons as Luis Buñuel, César Moro, Wolfgang Paalen and Alice Rahon. Because of her knowledge of Spanish, it was often up to Varo to find means of economic support for Péret and others in her household and this naturally took time away from her own creative work. Nevertheless, these new creative relationships, not to mention the stimulus of Mexican culture, propelled the development of her work in certain directions. By far the most important aspect of Varo's new life in Mexico was her artistic relationship with Carrington, a friendship filled with mutual regard and inspiration. A central aspect of their unique collaboration was their exploration of the sacred history and magical potential of women. As Janet A. Kaplan has outlined in her definitive text, Unexpected Journeys: The Art and Life of Remedios Varo, the two women explored the healing herbs and talismans sold in Mexican markets as well as the occult traditions of Europe. Together they developed a visual language that foregrounded an equation of feminine mysticism with artistic production and were the progenitors of certain avenues of feminist spiritual reclamation. In 1959, when Exploración de las fuentes del río Orinoco was painted, Varo was at the height of her artistic career and in the midst of a prodigious output of works that dealt with the metaphorical theme of esoteric searching. Slender and elegant women, looking much like the artist, populate these canvases, often astride fantastical vehicles of transit. Here a young woman conservatively dressed in a proper British trench coat and bowler hat (a reference to Carrington?) maneuvers in a boat that looks like a garment--replete with side pocket and buttons! Lost in concentration, she navigates by means of a complicated and amusing system of cords, propelled at top by wings reminiscent of the god Mercury. The "origin" of the river appears to be a goblet in a shrine-like hollowed out tree from which water flows, like the goblet of the Holy Grail or a bubbling alchemical beaker. Although interested in the mystical ideas of Gurdjieff, she was also, as Kaplan notes, "attracted to the logic and order of scientific investigation." In fact, a decade earlier Varo had made a journey on the Orinoco River in Venezuela with her then companion Jean Nicolle, who was working with a team of scientists organized by the French Institute in Mexico to study the agricultural potential of the region. It is this dichotomy that provides humor to not only this work but to many of her paintings--for her serious female explorers are on scientific safari to nothing less than the realm of dream. Susan L. Aberth, Ph.D., Annandale-on-Hudson.